Mixed media on paper, about 16 x 23 cm (6.3 by 9 in). Signed. Decorative period frame. Literature: Thieme-Becker, vol IV, 1910; Saur AKL, vol 13, p. 643; C. Belloni, I di pittori Olevano, R. 1970, 93 p.; Börsch, 1971; Staatliche Kunst-Sammlung Kassel, Neue Galerie, catalog of the paintings of the 19th Century, Kassel 1991, 22; List of stocks of the Stadt-Museums Berlin (Catalog Berlin and Märkisches Museum), I. 1, vol. 1994. The artist was the son of Henri-François Brandt and the nephew of Karl Begas. He studied at the Art Academy in Berlin and under Leon Cogniet in Paris, later he lived in Olevano near to Rome. 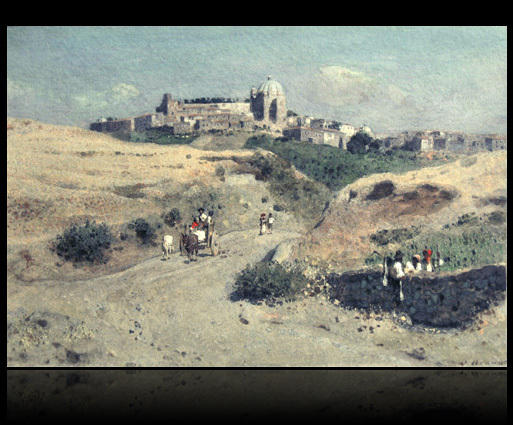 A impressiv view of Rome from the 19th Century, seen below from the Villa Pamphili-Doria. Fine original condition and decorative old frame.